On the 'The Fellowship of the Ring' disc one, we get a three minute SD alternate version of the council of Elrond, starring Sarah Michelle Gellar and Jack Black. 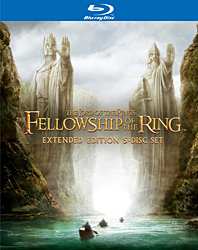 On the Appendices DVD discs, there is a symbol at the bottom of each page that is a not-so hidden link to the DVD credits. After finishing 'The Fellowship of the Ring,' watching through the end credits (or even fast forwarding through it all), you are brought back to the main menu, and if you let the screen sit for a short while, past where the audio cuts out, the menu seems to make a choice for you, the screen goes black, and Peter Jackson introduces the theatrical preview for 'The Two Towers.' Jackson says DVD, and it's in SD, so you know this is an old bit of footage from a past home video release.